Canon has given its Zoemini printer two new friends, each with their own built-in digital cameras. 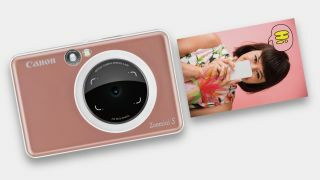 Aimed at smartphone users wanting to print their images, the Zoemini S (known as the IVY CLIQ+ in the US) and Zoemini C (known as the IVY CLIQ in the US) each combine a digital camera with an integrated printer, much like the Fujifilm instax SQ10 and SQ20 cameras, and countless Polaroid models that use the same ZINK printing technology. The Zoemini S is the more senior of the pair, with an 8MP sensor and a 25.4mm f/2.2 lens, together with a large round selfie mirror around its lens that's surrounded by eight LED lights for more flattering illumination. A more standard flash is also built into the model, and this is regulated through a switch on the top plate. The camera can focus 30cm away from the subject to infinity, and has a modest ISO range of ISO100-1600. With Wi-Fi and Bluetooth built in, it also allows the user to partner it up with an iOS or Android device, not only to print images from their device but also to control the camera through an app that offers self-timer and remote shooting modes. Available in rose gold, matte black and pearl white finishes, the Zoemini S swallows the same 2x3in paper as the Zoemini printer, with space for 10 sheets to be loaded in one go. It's also possible to print 2x2in prints with a border on either side through an aspect ratio button on the rear, and prints are said to emerge from the unit in around 50 seconds. Liked a shot you printed and want to print it again? A further button lets you do just that. The Zoemini S packs a 700mAh battery that's charged through a USB port at its base in around two hours, and this promises 10-20 shots per charge. A microSD slot sits next to this, which accepts cards up to 256GB in size; that's a hell of a lot of 8MP images. The other Zoemini C model is similar in many respects but it's furnished with a 5MP sensor and a square selfie mirror instead, and doesn't connect to the app. It's also set to come in bubble gum pink, bumblebee yellow, mint green and seaside blue finishes. The Zoemini S is set to be priced at $99.99/£109 while the Zoemini C will arrive with a $159.99/£149 price tag. Both should start to be available from mid-April. Prices for Australia have not been confirmed at the time of writing.